Hastings United striker Jack Harris is carried off by the club's strength and conditioning coach Harrison Grant after injuring his ankle last weekend. 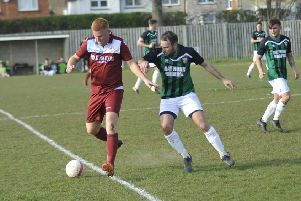 Hastings United Football Club is in the grip of an early season striker crisis heading into an important FA Cup match. The U’s are likely to be without at least three forwards, and quite possibly four, for the preliminary round tie away to Cray Valley (PM) on Sunday - a match where the winners will receive £1,925 from the FA’s prize fund. Jack Harris is facing a minimum of six weeks on the sidelines with the ankle injury he sustained at the end of last weekend’s league game against South Park. Although there’s no fracture, Harris has fairly severe ligament damage, and the ankle is very sore and swollen. Frannie Collin might be fit, but is more likely to come back from his injury next weekend, while Bright Temba, who like Collin has been out since pre-season, is still thought to be around 10 days from fitness. On top of that, Maidstone United could insist that United don’t field Jay May to prevent him being cup-tied. May scored in both of United’s first two league games after joining on a 30-day loan from Maidstone last Friday. Hare may elect to push Harry Stannard or Matt Bodkin up-front, and he also has the option of playing defender Steve Watt in attack, although he fears that such a move might lead to the team playing in a more direct fashion than he’d like. “We’re a good passing team and I want to continue that,” said Hare, who expects midfielder/left-back Sam Cole to be fit after being left out of the midweek game against Herne Bay as a precaution with a jarred knee and midfielder Simon Johnson to also make it despite taking a whack on his troublesome heel. United beat Southern Counties East Football League Premier Division outfit Cray Valley 3-0 at the same stage of last season’s FA Cup, but Hare is taking nothing for granted and says his players must be prepared for a battle. “They’re a division below us, but we’ve had them watched and I know one or two of their players, and they’re not too bad,” said Hare. If United win away to Cray Valley, they will again be away from home in first round qualifying on Saturday September 3, against Bishop’s Cleeve or Camberley Town. To Hare’s relief given the injury problems, United are without a midweek fixture next week (unless the FA Cup match goes to a replay) and he hopes to have more options for the Bank Holiday weekend games. Asked if he intends to extend May’s stay at the club beyond the initial month, Hare said: “If we get Frannie and Bright back, then argument suggests we might not need him.